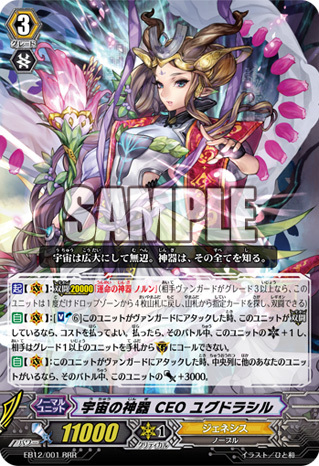 [ACT](VC): Legion 20000 "Regalia of Destiny, Norn" (If your opponent has a grade 3 or greater vanguard, only once, this unit may return four cards from your drop zone to your deck, and search your deck for the specified card, and perform Legion. )[AUTO](VC):[Soul Blast (6)] When this unit attacks a vanguard, if this unit is in Legion, you may pay the cost. If you do, until end of that battle, this unit gets [Critical]+1, and your opponent cannot call grade 1 or greater units to (GC) from his or her hand. 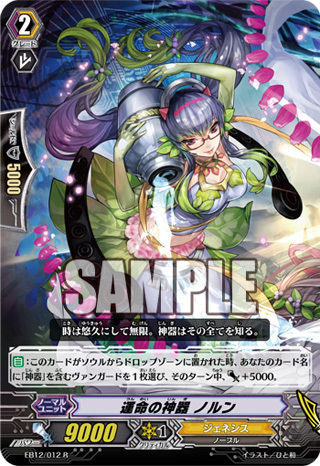 [AUTO]:When this card is put into the drop zone from your soul, choose your vanguard with "Regalia" in its card name, and that unit gets [Power]+5000 until end of turn.